With a week before Christmas, everyone’s in full swing planning the perfect day. That’s right, it’s the season of giving. But maybe we’ve all missed the point. Maybe we’re not meant to be giving to one another, maybe we’re meant to be giving to the council! That’s right. 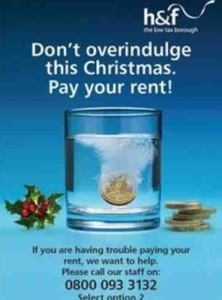 Hammersmith and Fulham Council has reminded local residents not to get behind on their rent by sending a ‘bah humbug’ Christmas card which reads: Don’t overindulge this Christmas. Pay your rent! There’s only two ways you can interpret this card – you can agree or disagree. I’ll give you 10 points for guessing what I think of it. Here’s a clue: I take offence. If 46 per cent of residents are in arrears then I don’t believe this tactic is going to make much difference. Rather than make the residents feel guilty, it’ll just have a negative impact on the council. It’s bad PR through and through and leaves a bad taste in people’s mouths. Essentially, if the council thought they were going to get their money before the big day, then they’ve made a big mistake. More than causing uproar – many labelling the act ‘disgusting’ – it’s even prompted some to request updates via the Freedom of Information Act to find out how the cards were distributed. According to What Do They Know?, an 81-year old woman, who’s apparently never been late with the rent, was left ‘extremely distressed’ upon receiving it. And who can blame her? It’s hardly subtle. The council may well think it’s appropriate to thank the BBC on Twitter for helping them to generate coverage with the scheme, but I think they’re underestimating just how much this could backfire. I’m not saying that being late with the rent is acceptable – when your payment is due you’re obliged to pay up. But, when you compare it to dropping a threatening card through someone’s door seven days before Christmas, you’ve got to question who’s really in the wrong. What do you think – have you had fake Christmas cards through the door?